When looking to update a bathroom, most people are looking to create a "modern" space. But what exactly does that word mean? Surely, even someone with a general idea of current interior trends knows that it hints at a sanctuary, a place to unwind from the surrounding world's pressures. It may also infer at a hideaway that has enough storage, and natural light, and sleek features. And above all else, it has adequate water pressure and a place to admire a certain someone's reflection. The truth is that a modern bathroom can be interpreted in a number of ways, but all have to strike a balance between luxury and convenience. Luxury, for instance, can be accomplished with a double vanity and even a roomy tub, whereas convenience can be exemplified with easy-to-clean tiles and enough shelving for a collection of products. Once these two must-haves are met, then a mix of timeless and colorful touches complete the look of a modern bathroom. We found 10 instances of modern bathrooms that deserve such a title, thanks to the likes of functional but stylish details that make it a cinch to relax. Because if there's anything today's homeowner wants, it's an equally modern place to get some peace of mind. If your eyebrows rose an inch or two when you caught a glimpse of this bright bathroom, you're not alone. 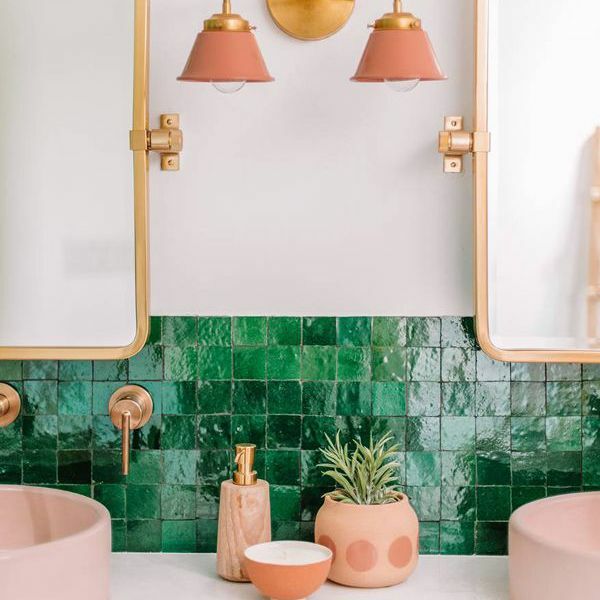 Its confident mix of emerald green tiles in the angular shower and pink-and-red ones on the floor make for a standout finish, and one that captures a modern taste for making a bold impact. The colors are contained with white and beige accents as to not be overpowering, and there's enough storage to make the space functional, too. A mix of bold tiling and white walls are also what designates this casually blue bathroom by Eye for Pretty as "modern," since the past few years have seen the popularity of bold floor tiling increase as a way to showcase personality. Clean, no-nonsense mirrors are also aspects of this trend because their simplicity helps to balance out those more vivid details. White tiles are a timeless bathroom feature, but it can feel more modern depending on the finish. In this Emily Henderson-designed home, a herringbone pattern for the flooring gives this bathroom a modern edge, which is also complemented by the floor-to-ceiling blue tiles on the wall. It's also increasingly popular to stack tiles, too, as a fresh departure from more expected layouts. Another clear sign of a modern bathroom is sleek black and gold accents, and this one from Studio McGee nails it. The beige double vanities add some texture to the look, but those two shades are what stand out. Aside from that stacked tile look, this bathroom from designer Sarah Sherman Samuel introduces a traditional material that's recently reemerged as something modern: terrazzo flooring. Samuel created a geometric pattern on the floor that would pair well with the green tiles, and its gold grout matches the surrounding fixtures. Sarah Sherman Samuel also nails the modern bathroom look in this instance, thanks once again to the gold accents and detailed tiling, but also because of the wood details. Convenience also comes into play when using a ladder as towel storage, and the floating vanity is also stunning proof of form and function. Penny tiles are yet another traditional aspect of a bathroom, but they are given a modern twist in this example from GRT Architects because of their unexpected colors and fun design. For the most part, modern bathrooms are sleek with impactful but straightforward twists, and the zigzag pattern of the floor-to-ceiling tiles are just that. Creating a bathroom that's a sanctuary is a hallmark of a modern bathroom, and that lesson is often interpreted with lush potted plants. In this design from Katherine Carter, a traditional clawfoot tub is accompanied by a bright green plant for a relaxing detail to an otherwise timeless white bathroom. A modern bathroom has more than enough storage to retain its ultra-clean appearance, and this bathroom from Elizabeth Roberts fits the bill. As you've likely already noticed, sconces are also widely used in today's bathrooms. Here, detailed design on this sconce matches the colors in the nearby runner. By now you've learned that black accents, bold floor tiles, clean finishes, and color are all details of a modern bathroom. And this one, which is also from Elizabeth Roberts, encapsulates that checklist. The pink vanity is an irresistible touch, and the rounded mirrors add to its overall soft, approachable look. Up Next: 7 Subtle Mistakes That Instantly Cheapen Your Bathroom.